Born in Antwerp, Sustermans was a painter whose style was broad, using elements from the Baroque era of Flemish, French, Spanish and Venetian painters. He was sometimes known as Giusto Sustermans from his time in Florence under the patronage of the Medici family. He painted many portraits for the Medicis, as well as work commissioned for the celebration of Ferdinando II Medici’s (1610 – 1670) accession as Grand Duke in 1621. A preparatory drawing from this commission survives, The Senators of Florence swearing Allegiance to Ferdinando II de’Medici (Ashmolean, Oxford). Sustermans painted a portrait of Ferdinando’s wife, Vittoria Della Rovere, a piece now in the Prato Museums. He painted works in Mantua as well of the Duke Ferdinando I Gonzaga (1587 – 1626), who had married Caterina de’Medici (1593 – 1629). He also painted Ferdinando’s brother and successor as Duke in his work, Vincenzo II Gonzaga Wearing a Cloak of the Order of the Redeemer. 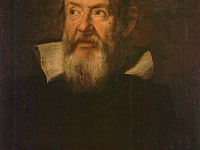 He painted portraits of the Medicis circle of friends as well, including the Astronomer Galileo Galilei (1564 – 1642). One of Galileo’s portraits was commissioned for the Pandolfini Palace in Florence, a work now in London. Sustermans is known to have painted three portraits of Galileo, one of which is now in the Uffizi Gallery. It is interesting to note that the Medicis were patrons of Galileo, but when the scientist was convicted of heresy it was Ferdinando II who refused to support him anymore. Nonetheless Galileo named many of his discoveries after members of the Medici family, but just as the Medici’s support eventually ended for Galileo, the names he gave did not survive in the Stars as well. Sustermans also painted historical works such as, The guest meal of Cleopatra. He died in Florence and enjoyed a reputation there as one of the more prominent portrait painters.